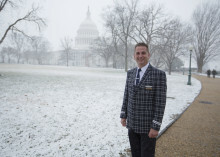 U.S.-based Norwegian flight attendants: Does my job not matter? "Most of my colleagues and I have worked for a number of airlines and it saddens all of us to hear that we are “stealing American jobs” when we are in fact Americans." More jobs. Greater competition. Affordable fares for all. That's Norwegian. More jobs, greater competition and affordable fares for all -- watch this video to find out how ‪Norwegian‬'s expansion will bring benefits across the US and Europe. Norwegian to launch direct, low-cost service from Boston and New York to Cork, Ireland – the only transatlantic flights to operate to Cork Airport – and service from Cork to Barcelona. 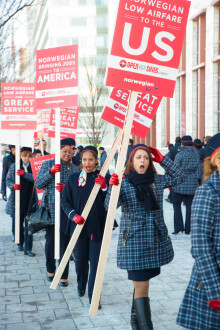 This morning about fifty flight attendants from Norwegian’s U.S. bases united at the steps of the U.S. Department of Transportation in Washington, DC. They took action to voice their support for Norwegian Air International’s (NAI) application for a foreign air carrier permit application and urged the Department to approve it without further delay. 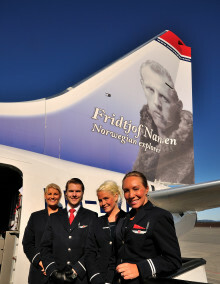 Norwegian continues to grow in all markets. Norwegian carried more than 1.6 million passengers in January 2015, an increase of five percent compared to January last year. The load factor was 80 percent in January, up 5.2 percentage points. Norwegian’s passenger growth continued in October. The company carried more than 2.2 million passengers this month, an increase of 15 percent compared to the same month previous year. The load factor was 81.6 percent, up 2.3 percentage points. Norwegian reports strong growth in all European markets with a capacity increase of 36 percent and a load factor of 85 percent in its third quarter results. The pre-tax result (EBT) was 505 MNOK, compared to 604 MNOK the same quarter previous year. The costs associated with wet-leasing replacement aircraft and a weak Norwegian Krone (NOK) significantly affected the figures. Norwegian scooped three prizes at the prestigious Passenger Choice Awards 2014 in California last night. It won the categories Best in Region: Europe and Best in Inflight Connectivity & Communications. It also won an Avion Award in the category Best Single Achievement in Passenger Experience for its moving map on the 787 Dreamliners. Norwegian is offering lounge access and improved in-flight service to its customers with premium tickets on intercontinental routes. Norwegian Air International Remains Confident that it Will Receive Necessary Approvals; No Impact on Existing Flights between Europe and the U.S. 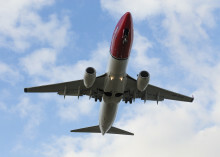 The U.S. Department of Transportation (DOT) announced today that it will require additional time to reach a decision on Norwegian Air International’s (NAI) application for a foreign carrier permit to serve the U.S. from Europe. Until then, Norwegian Air Shuttle will continue to operate flights to the U.S. under its existing authority from DOT. Norwegian carried approximately 2.5 million passengers in July 2014, an increase of 17 percent compared to the same month previous year. This is the highest number of passengers Norwegian has carried in a single month. The load factor was 88.2 percent. Norwegian (NAS) today reported a second quarter 2014 net profit of 128 MNOK. The second quarter is characterized by strong growth and a record high load factor, and influenced by significant, one-off costs, a weak Norwegian currency and high oil prices. The strike from labour union Parat earlier this year alone cost Norwegian over 100 MNOK in lost revenue. NAI responds to former Secretary of Transportation Ray LaHood's distorted op-ed. Norwegian Air International’s application to operate to the US is long overdue and is being opposed by several large airlines and their powerful labor unions in an attempt to block competition. However, Norwegian’s opponents know that the application is in full accordance with the US-EU Open Skies accord. Norwegian Air has for the past year offered 100,000 Americans the ability to fly affordably between the United States and Scandinavia on its fleet of brand new Boeing 787 Dreamliners. Norwegian has also carried 200,000 passengers to the U.S., giving a boost to American tourism. Norwegian Air’s first ever flight from Los Angeles to Oslo, Norway, took off this evening from LAX airport. The flight was fully booked. No other airlines offer non-stop flights between Los Angeles and Oslo. Norwegian Air’s first ever flight between Orlando and Oslo, Norway, took off Thursday evening. The first flight was almost fully booked. 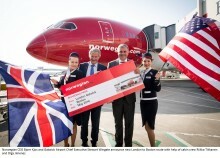 Norwegian is the only carrier that offers non-stop flights between Orlando and Scandinavia. More than 60 new United States-based Norwegian Air International employees have signed letters enthusiastically and unequivocally supporting new service by the airline to the U.S. Many of the new employees have deep experience flying with both domestic and foreign airlines, and are thrilled with the positive, energetic and cooperative work environment the airline offers. Norwegian Air continues to expand internationally and is currently recruiting pilots for its crew base at New York’s JFK airport. 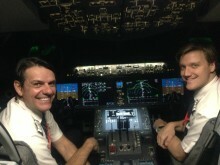 The company is recruiting captains and first officers to operate the state-of-the art Boeing 787 Dreamliner. The low-cost airline offers non-stop flights from several U.S. cities to Europe.